Ever since the first tomtit block came back from the pattern testers, I have been dying to give it a shot. Unfortunately, I had to be patient as this was another block that had to wait on the arrival of my fabulous black fabric. It was worth the wait- another fun block don't you think?! When I first decided to turn my bird blocks into a quilt, you may remember that I was a bit worried that I wouldn't be able to pull all the disparate blocks together into a cohesive quilt. But I must admit that it is a real joy to see how easily this quilt is pulling itself together. I am finding there are very few fabrics that only turn up in one block. The majority of the fabrics can be found on multiple birds and as such this brings a cohesion to the disparate fabrics. For example, the fabrics which only the other week were perfect for the penguin have also proved to be great for the tomtit. The wing fabric of the waxeye can be found on the head of the Kea. 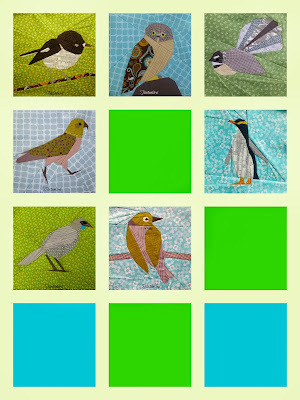 I am really enjoying finding the right fabrics not only for each bird, but for the quilt as a whole. In the meantime I'm trying to decide which block to try next. I'm thinking maybe the pukeko or the kakariki... we'll see! 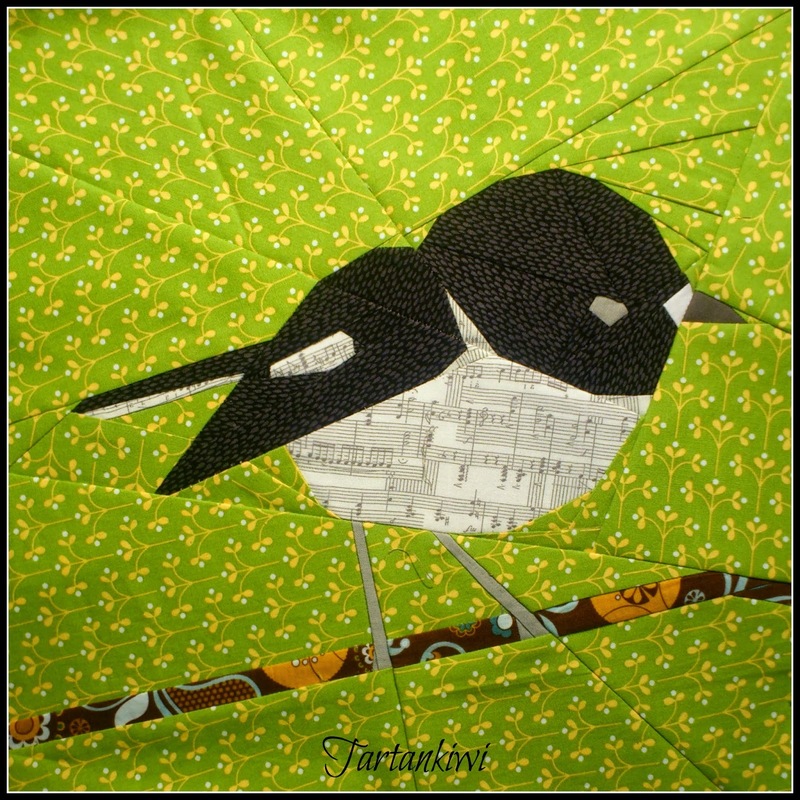 Before I forget, here are my pattern testers takes on the tomtit block. The minute that I suggested that I might possibly design a tomtit block, Amanda put her hand up to test it- how could I ignore enthusiasm like that?! Don't you just love the skinny orange legs on this wee guy?! Leonie had fun with this wee guy! Isn't he great! looks awesome as always :) I love seeing this quilt come together! Oh so cute!! Love him!!! It's going to be a gorgeous quilt!! I love the music sheet fabric print you used on your little cutie. Nice! I love how round the belly and head are!